Alano Edzerza is a thirty-year-old Tahltan artist whose work ranges from architectural commissions and uniforms for the Dutch Olympic team to T-shirts and hoodies. 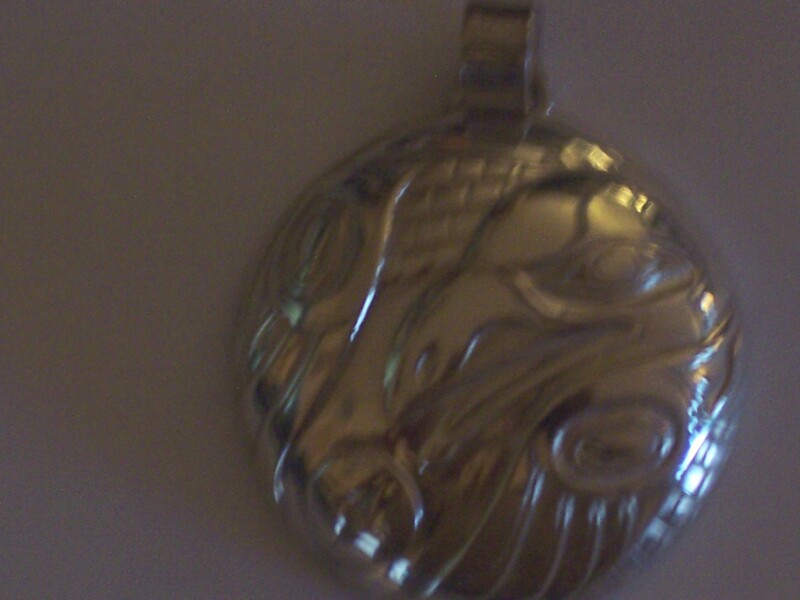 Although he sometimes duplicates the same design in different media a little too often, on the whole, his work is a good example of how you can find something for every budget in Northwest Coast art. So long as you’re not looking for one-of-a-kind pieces, you can often find pieces of work for $200-$500 in the gallery that carries his name. Edzerza has often worked with Chilkat designs, but, because they originate in weaving patterns, seeing a single element like this is startling. More often, a Chilkat design will have a number of elements, often repeated, with the result that you rarely linger over a single element. Isolated here, the design gives you the chance to study the face at length. 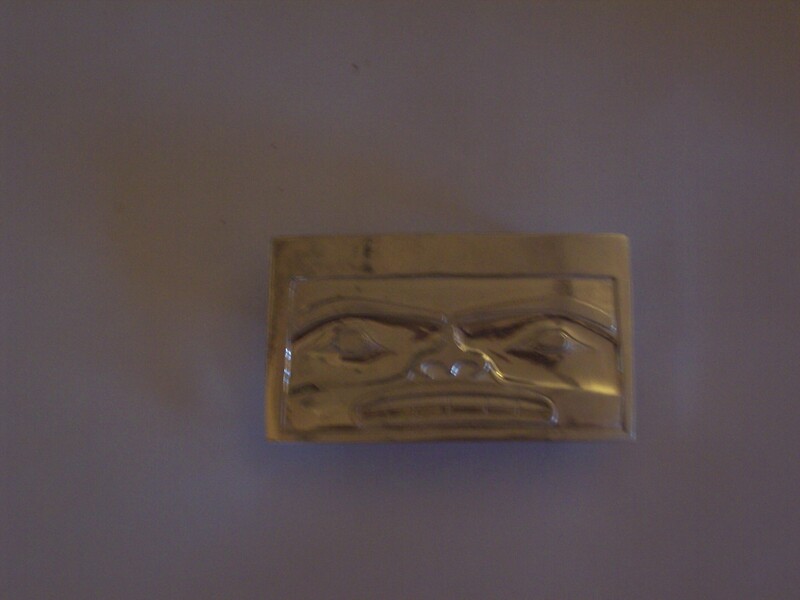 In fact, it wasn’t until seeing this belt buckle that I realized that Chilkat designs (of which I know very little) are structurally closer to the formline designs of paintings and carvings than I had realized. 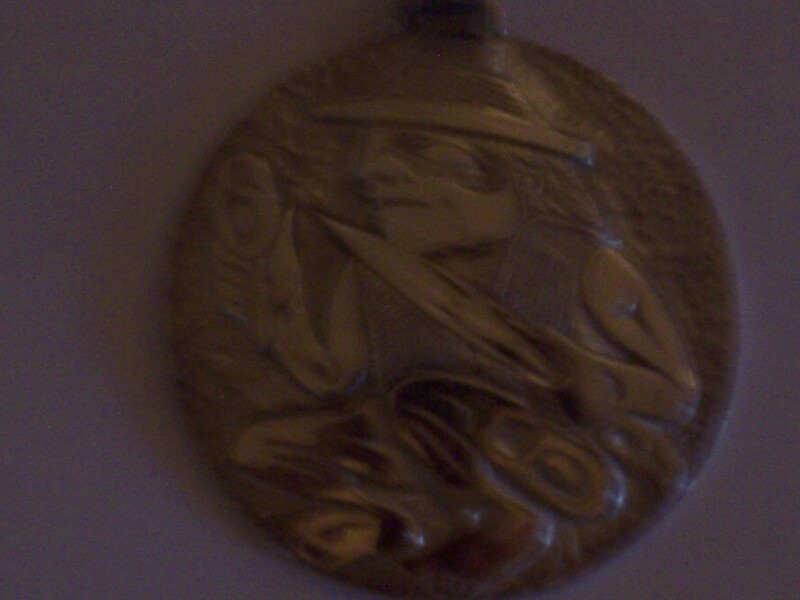 The pendant is non-traditional, of course – if anything, the crouching figure of the shaman reminds me of some Old Norse drawings I have seen of Woden. This (presumably) accidental resemblance seems appropriate, since, like the Old Norse god, this shaman with a rattle in his right hand and a knife in his left combines elements of both the magician and the warrior. Unfortunately, this picture suffers from the limitations of my digital camera. As a result, you will have to take my word that this casting manages to capture the strong sense of line for which Russ is famous. That is not an easy thing to do, and many casts I have seen of original works are muddied versions of the original. But here, Edzerza – who also shows a love of a good line, both in the occasional borrowing and his own original ones – has managed to give a strong suggestion of what the original must look like. Works like these do not increase in value like exclusive works. But, at their best – as in these three pieces – such commercial works make a bit of beauty accessible to any budget. One of the ideas that keeps circulating through books and blogs about business is that emails should always be kept short. The suggested rules for keeping them short vary – less than a hundred words, short enough to be read without scrolling, and, most common of all, two to three sentences – but the idea is similar, regardless. It is also an idea that can do as much harm as good. There are at least two rationales for this idea. The first is that if you are sending a marketing mailout, shorter ones are more likely to be read than longer ones. However, given that mass mailouts are likely to be flagged by spam filters, I suspect that the length doesn’t matter much, and that mailouts of any length are most likely to go to the Trash folder unread. Moreover, most emails are not mailouts, and, in a business context, you can count on them being read regardless of length. The second is more convincing: Conciseness is more forceful, and more respectful of the recipients’ time. And, certainly, many emails, such as those arranging a time and place to meet, hardly need more than a sentence or two. However, if issues are being discussed online, a brief email will hardly be enough. You should still make sure that an email is no longer than it needs to be, but if what you are discussing needs eight hundred words, then by all means you should give it eight hundred words. I immediately understood that the first sentence referred to the Greek food that the sender would be bringing around to my townhouse tonight. However, at first I interpreted the second sentence as a question about how much food should be bought. It was only after I replied that I realized that the second sentence was referring to another matter altogether – how many cardboard boxes the sender should bring, since they were helping me pack. This is a trivial matter, but it shows how easily conciseness can create confusion. Moreover, in many contexts, being concise can create a negative impression. It can sound curt or rude, or even indifferent, even if your intention is not to create such an impression. Communication is always as much about relationships as it is about the ostensible subject, and, when you are being concise, on of the aspects most likely to be left out is the relationship part. If you get too caught up with efficiency and forget this fact, that you can easily leave the recipient feeling slighted. The sentiments were right here, but the shortness of the sentences undermined them, making their expression sound formal and insincere. The email also has a staccato rhythm and regularity of structure which makes it sound even more perfunctory. It sounded so indifferent that I found myself wondering why the sender had even bothered. It is just as short, and just as obviously from someone who does not know me particularly well. Yet it takes the time too be personal in a way that the other email did not, and as I result, I found some small comfort in it. Novice writers might be tempted by simple rules to help them write better, but the point is that they rarely work. Follow a rule like the three sentence email, and you can cause yourself more problems than you solve. In the six weeks since my partner died, I have spent much of my spare time cleaning the townhouse. Neither of us were particularly tidy people – although we both placed a high value on hygiene – and we hadn’t done a thorough cleaning in years. She had been sick a long time, and in the last few years, we had had better things to do. Recently, I have been undoing the years of neglect, and finding, somewhat to my surprise, that I am enjoying the process of tidying, and finding it both satisfying and therapeutic. For a long time, I have referred to reducing clutter as “easing the karmic burden.” That is meant as a wry reference to the idea of not burdening yourself with possessions, but it seems to me literally true. Getting rid of non-essentials feels very much like organizing myself, or perhaps getting rid of distractions. Then, too, I suppose that creating order out of chaos is one definition of creativity. Organizing my desktop or library may not be actually creative, but it feels like it is. In a milder way, the sense of accomplishment that comes from tidying feels much the same as that when I complete an article or a poem. In the last six weeks, those feelings have been especially important to me. But, even more to the point, I’ve needed something meaningful or useful as a distraction from grief. I haven’t been capable of much original effort (which makes writing articles painful, let me tell you), but tidying has been something I could accomplish without a great deal of thought. Moreover, in this case, tidying has been a way of dealing with grief. As I sort through a closet, I remember when something was bought, or who gave it to whom, and what we said at the time. I find parts of our lives that I had forgot about, or even parts of Trish’s that I only knew vaguely, or not at all – something I would have said was impossible after all the years of our marriage. I have even discovered gifts that she had bought for me, but never given. At times, I’ve broken down while cleaning, and worked with streaming eyes, or had to sit down and rest because I was overwhelmed. I sometimes think that, had I known the scope of the task I was undertaking, I never would have started it. But, mostly, I think I wouldn’t have missed the experience for any reason. In tidying my external environment, I’ve been doing some internal sorting as well. If I finish the process in a few weeks, as I intend, in many ways I’m going to miss it. I don’t know if I will keep the townhouse as tidy as I’ve already made several rooms and plan to make the rest. I think I will, at least for a while, because the result appeals to the austere side of my nature. But if I backslide, that wouldn’t be the worst thing that could happen, because the effort of tiding will have already served its purpose for me. The concept of a friend on Facebook is (to say the least) elastic. At its loosest, it can mean someone who might be useful to know, but with whom you have never interacted. At the opposite extreme, it can mean an intimate, or someone with whom you regularly interact online. But, no matter how a Facebook friend is defined, unfriending someone is generally considered a serious step, and I’ve only done it three times. The first time, I made the mistake of accepting a friendship invitation from a friend of a friend. A few days later, the friend of a friend started chatting with me and tried to interest me in what sounded like a pyramid scheme. I made an excuse to log off chat and instantly unfriended them. The second time involved an acquaintance who indulges in yellow journalism. They are careless of their facts and their logic is slippery, but they expressed an admiration for my writing, and I thought that maybe if they were taken seriously by other writers, they might evolve into an effective journalist. But then they turned their tendencies on me without any warning or apology, and I decided I wasn’t about to mentor someone who wanted to tear me down in order to build their own reputation. That wasn’t what friendship was about, so far as I was concerned, so exit another Facebook friend. The third time was more complicated. It involved someone I had known for years. A few years previously, we had quarreled, but they approached me on Facebook and, despite some qualms, I accepted their friendship invitation. I had always admired this person’s brains and talents, and I frankly hoped to get to know them – to become a friend in real life, as I expressed the hope to myself. However, I had forgot that one of the reasons we had quarreled before was this person’s inability to keep up their side of a correspondence. From somewhere – probably a bad book on business management – they seemed to have got hold of the idea that online correspondence should be limited to two or three sentences. To make matters worse, what they did write was so stiff that it sounded cold and condescending – and I have never been able to endure being patronized. The tone killed all efforts to strike up a conversation, and I soon realized that the development of any actual friendship would require the effort put into the first six days of creation and geological units of time, neither of which I had to spare. Even so, I might not have bothered unfriending under ordinary circumstances. But my wife was hospitalized and dying, and so was a relative of this person. I suggested (in effect) that we might give some mutual support, and received another cold reply, which indicated to me that I was just another part of their effort to compile the largest possible collection of Facebook friends. Granted, their own relative had also died. Yet even the person’s own grief could not justify such a chilly reaction. There I was, facing one of the worst experiences anyone can face, and instead of any real sympathy, what did I get? An insincerity worthy of Dale Carnegie. Anyone else would have mustered a little empathy, being in a similar position. Instead, I unfriended, and – not wanting to appear a coward – sent a brief note saying that I had done so. I said that if they wanted to talk, I would, adding that they probably wouldn’t care for what I had so to say. I heard nothing, so I knew I was doing the right thing. Still, I admit that I regret this third and latest unfriending in a way that I never did the first two. But what choice, really, did I have? I have (and have had) friends of both sexes that have my back the way that I have theirs. I don’t need a hanger-on too egocentric to know what friendship is about. Or do I make too much out of a word that, on Facebook, no longer retains its original meaning, except by chance? Maybe. But all I know is that recently I am now much choosier about the friendship offers I accept. Back in June, I had dinner at the Steamworks pub with Haida / Tsimshian artist Mitch Adams and his wife Diana. Mitch kindly offered me a selection from the giclee prints that he was in Vancouver to sell. Few things feel so luxurious as a choice like that, and I could have selected several from his portfolio. 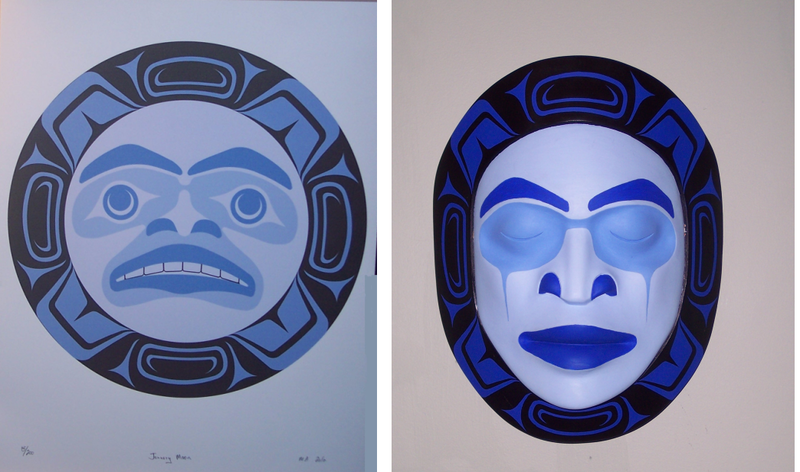 However, eventually I decided on “January Moon,” which was the inspiration for his “Blue Moon Mask,” which was one of the standouts at the 2010 graduation exhibit for the Freda Diesing School of Northwest Coast Art. The most obvious differences are in the shape and color. With its perfectly round shape, “January Moon” feels relatively static, and more abstract. In comparison, the change to an oval face in “Blue Moon Mask” is more ambiguous, as well as more realistic. Just as importantly, the colors are bolder and more glossy in the mask, as well as the contrast between them. In the print, the colors are muted, and the tones are a better match, but the result is that design tends to fade into the paper. The exception to this general observation is the blue and black design on the rim. “January Moon”’s rim has more contrast between the colors, while “Blue Moon Mask”’s uses a darker blue that is much closer to the black. This change works because it frames the face most clearly; in “January Moon,” the blue of the rim is closer to those of the face, so that the rim frames less effectively. However, the greatest changes are in the face. Some elements remain the same, most noticeably using the same colors for the lips, nostrils, and eyebrows. But, in “January Moon,” the eyes are also the same color, which is probably one feature too many for the design, which seems much busier than the mask. By contrast, on “Blue Moon Mask,” the design is simplified. The teeth are gone, whose black outline is mildly discordant in “January Moon,” and much of the complication of the highlighting as well. The eyes shrink from an angry glare to closed eyelids, and the lips are smaller and barely parted instead of scowling. The only element that is added is the tear tracks from the eyes, which I suspect originated in an accidental trickle of paint, but which works brilliantly, helping to emphasize the elongation of the face and suggesting an undercurrent of suppressed intense emotion beneath the surface appearance of serenity. None of this is to dismiss “January Moon.” Its non-traditional eyes with their crescent moon and the creation of the nose through a clever use of negative space are admirable in themselves – so much so that I could wish they could have somehow been retained in “Blue Moon Mask.” But in the end, “January Moon” could be described as a first draft for “Blue Moon Mask.” Although “Blue Moon Mask” is the superior work, very likely it would not have succeeded if “January Moon” had not been created first. Together, they show an artist taking a leap in his development – and, I suspect, learning a lot in the process himself.